Support the production of the film «I Charleston Genève»! An unconventional scenario and sparkling routines to show how our Geneva swings! Tellement fières de vous !! Thierry et moi avons hâte de voir le film. Tout aussi hâte de nous déhancher avec vous au son d'un bon swing. This project ended successfully on 4/7/2016 11:00! You receive a «making of» photo of the crew and dancers, which we’ll take at the «Bains des Pâquis» set, autographed by the production crew! (to pick up at the Premiere or at a time of your convenience) + your name in the credits! You receive a voucher for 2 dishes (pizzas, etc.) and 2 drinks at the Scandale Restaurant + votre nom au générique ! You receive a poster of the film, signed by the production (to pick up at the Premiere or at a time of your convenience) + your name in the credits! You receive a voucher for a cupcake design workshop (1h30) at Cuppin’s + your name in the credits ! You receive a voucher for a Burlesque workshop with the Secret Follies school + your name in the credits! You receive a voucher for a 3-box pack of the famous Rohr chocolates «Poubelles Genevoises»: a 16-piece box, a 9-piece box and a 4-piece box + your name in the credits! You receive a DVD of the film autographed by the production crew (to pick up at the Premiere or at a time of your convenience) + your name in the credits! You receive a voucher to use at the vintage shop «La Fiancée du Crocodile» worth CHF105.-- (average price of a pin-up dress) + your name in the credits! You receive a « contributor pack», including a ticket to the Premiere (screening and social dance party) + a DVD of «I Charleston Genève» + a poster of the film autographed by the crew + your name in the credits! You receive a voucher for an individual 90-minute Corporal Psychology session at «l’espace Souffle de Vie» + your name in the credits! You receive a voucher for a weekend group workshop in Corporal Psychology at «L’espace Souffle de Vie» + your name in the credits! 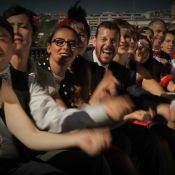 You receive a free semester of Lindy Hop dance classes with Geneva Swing + your name in the credits! You receive two free semesters of Lindy Hop dance classes with Geneva Swing + your name in the credits! We are a group of passionate swing dancers brought together by Geneva Swing (Association pour la Promotion des Danses Vintages à Genève). Since 2011, Jérôme and Ana have worked tirelessly to build up the Geneva swing scene from scratch by organising regular classes and dances, vintage events and workshops with world-renowned instructors and coaches.